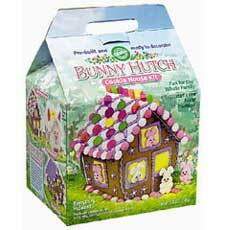 Gingerbread Easter Bunny Hutch Kit – Fun And Yummy Too! Pre-baked and Pre-assembled Gingerbread Easter Bunny House, Easter Bunny Hutch Kit! Just image how much fun the kids will have decorating this house for the Easter holiday! It’s the perfect springtime project, and a cute centerpiece for your Easter table. So hop to it–everything is included- a pre-baked, pre-built house, white and lavender decorating icing mixes, candies, pre-made icing decorations, 2 cookie bunny ears, 2 decorating bags and tips, cardboard base and complete instructions with great decorating ideas. Visit WILTON for more details!